Perform accurately, safe and uniform application of the coating against wear on metal parts of varying sizes. The main challenge was to build an adaptable machine in the three planes of the Cartesian axis, allowing the movement of the piece. Furthermore, the application of the coating should be robotized. The Team CRK has created a solution that allows an industrial robot to perform the application of the coating on workpiece of varying sizes. To achieve the best result, a robust structure that moves the robot was created, making it possible to increase the robot’s reach 2.1m to 5,4m on the x axis, from 4.2m to 6.5 m on the y axis, and 2.5m to 4.5m in the z axis of the Cartesian plane. The control of each axis is totally automated, enabling many possibilities of work to the operator, who has the power of choice based on the best form of application and less time depending on the type of coating and shape of the workpiece. The special machine carries out the use of a robot, the application of the coating against wear parts of various sizes. 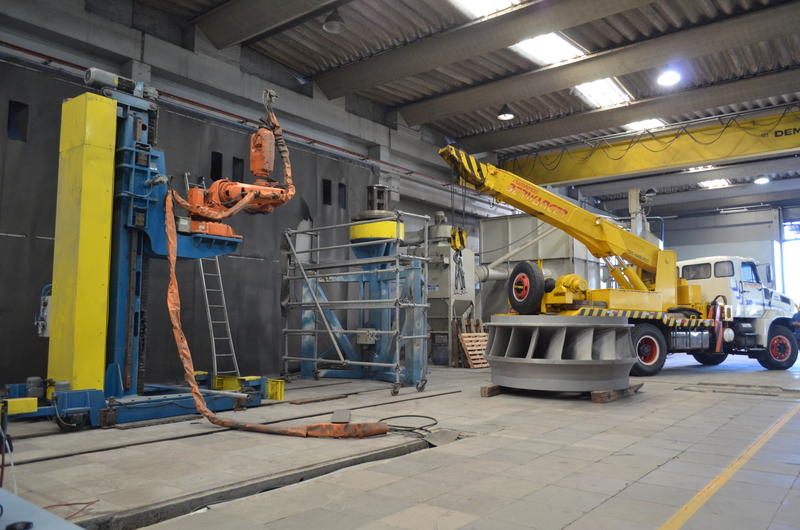 Our client can realize the application of the coating even in a hydroelectric turbine rotor, becoming the only provider of this service in Brazil. Furthermore, the application of this coating allowed to our customer to provide an increased useful life of the rotor by 300%. The use of a robot to guarantee the accuracy of uniform plating across the surface of the workpiece. The operator only defines the position and intensity of the coating application jet and the machine does the work itself. Watch in the video below a demonstration of the machine. © 2019 CRK. All rights reserved.